The CISA News Agency reports that plans to establish a second Catholic University in Kenya are underway as two leading Catholic institutions – Tangaza College and the Consolata Institute of Philosophy – will merge. According to Fr Patrick Roe CSSp, the Principal of Tangaza College, the merger between the two institutions will be officially formalised on October 24, 2011. At present Tangaza College is a constituent college of the Catholic University of Eastern Africa (CUEA) while the Consolata Institute of Philosophy is run by the Consolata Missionaries. Fr Roe spoke during the official opening of the first semester of Tangaza College this year, where he concelebrated mass with his counterpart from the Consolata Institute of Philosophy, Fr Luciano Zucchetti. The merger was approved in April 2011 by the Board of Trustees of the two institutions. Once the merger is complete, the new institution is expected to seek full university status from the Kenya government, becoming the second Catholic University in Kenya after the Catholic University of East Africa (CUEA). According to Fr Roe the proposed ‘Tangaza-Consolata University’ would be a boon for both institutions as many students at Tangaza College went through the Consolata Institute of Philosophy. The university would introduce a number of faculties to serve both the religious congregations and the wider church in Kenya. The theology lecturer said, “We are two institutions that have grown side by side. It is fitting and proper to bring them together”. Currently Tangaza College has 1,250 students while Consolata Institute of Philosophy has 300 students. The Wall mural below indicates the different nationalities which make up the SMA today – coming from Africa, Asia, the Americas and Europe. 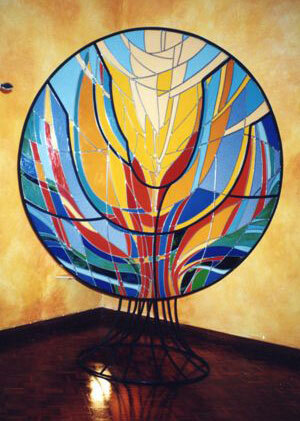 The picture at the top of the page is of a Stained Glass piece in the SMA House of Studies Chapel in Nairobi. The Society of African Missions (SMA) sends its 25 seminarians to Tangaza for Theology and 18 others to Consolata for Philosophy. 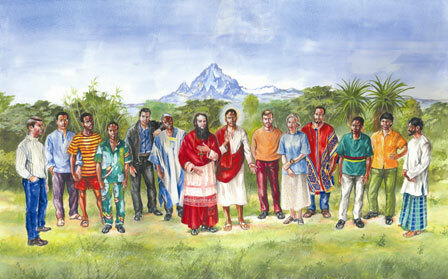 They come from several countries where the SMA is present, both in west, central and eastern Africa. Among the 43 SMA students are four Deacons who will, please God, be ordained priests in 2012. As a corporate member of Tangaza, the SMA is fully committed to its future development. Fr Michael McCabe SMA is its Head of the Mission Studies in the School of Theology. Fr Michael is the author of several articles in the areas of Mission Theology, Interreligious-Dialogue and Justice & Peace issues. The SMA House of Studies staff are four in number: Fr Fabien Gbortsu (Superior, from Ghana), Fr Moses Chileshe (Dean, Zambia), Fr Emmanuel Andoh (Bursar, Ghana) and Michael McCabe (Spiritual Director, Ireland).